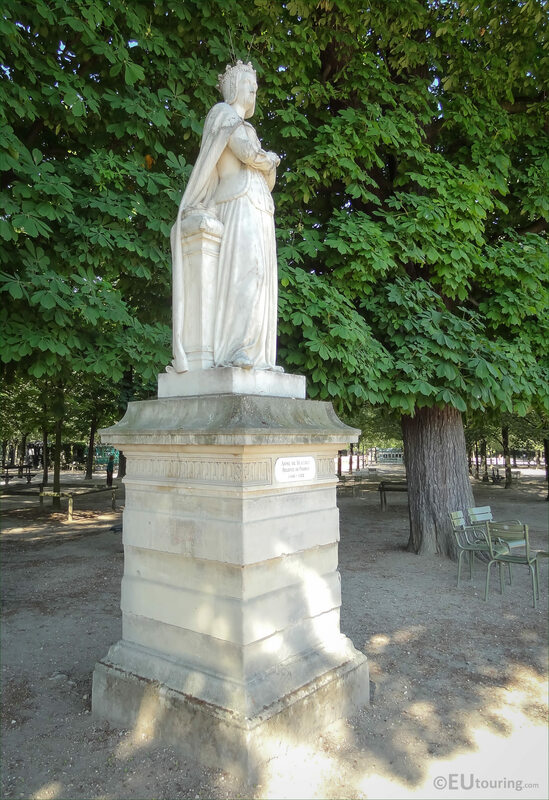 We were again in the Jardin du Luxembourg, which is located in the 6th Arrondissement of Paris, when we took these high definition photos showing the statue of Anne de Beaujeu that was sculpted by Jacques Edouard Gatteaux. 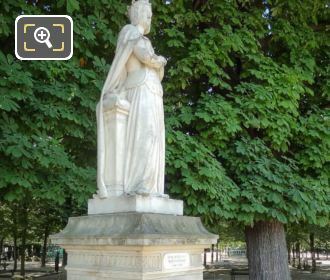 This first HD photo shows the statue of Anne de Beaujeu, who is also known as Anne of France, and this is one of the Reines de France et Femmes Illustres, which in English translates to Queens of France and Famous Women, and this was one of the statues chosen by King Louis Philippe I to adorn the terraces of the Luxembourg Gardens. 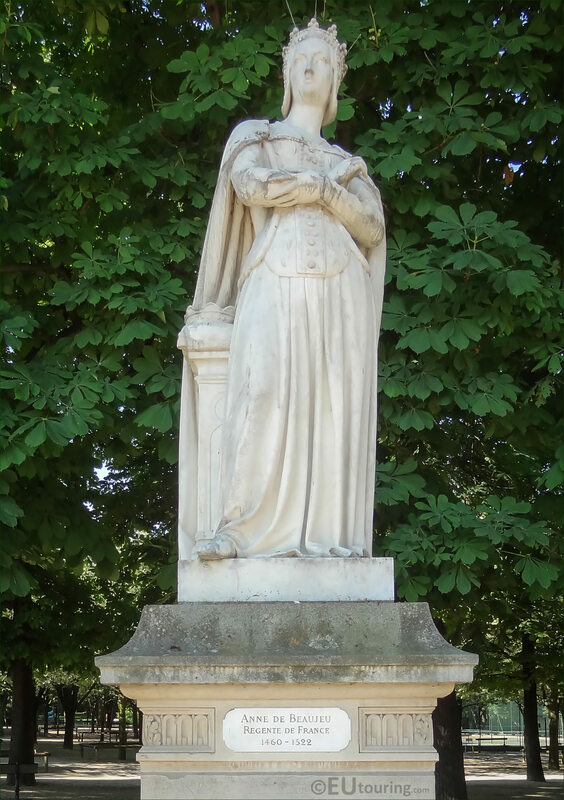 Now this statue was made of marble from Saint-Beat, which is located in the south of France close to the border with Spain, and was commissioned to the artist Jacques Edouard Gatteaux for the sum of 12,000 French Francs by virtue of a Ministerial decision that was dated 19th March 1844. And Jacques Edouard Gatteaux was born in Paris on 4th November 1788 and initially studied under his father who was medal engraver, and therefore he became a medal engraver himself, but also a French sculptor, winning the Prix de Rome in 1809. So this statue of Anne of France measuring a height of 2.3 metres not including the base, was completed by the artist on 8th January 1847 then exhibited at the Paris Salon that same year, which was item number 2089, prior to being installed within the Jardin du Luxembourg. Now in this photograph you can see a close up of the plaque located on the base of the statue showing the name Anne de Beaujeu, Regente de France, and it shows here that she was born in 1460, although some sources state 1461, yet according to the sources we have come across, they all state her year of death as 1522. 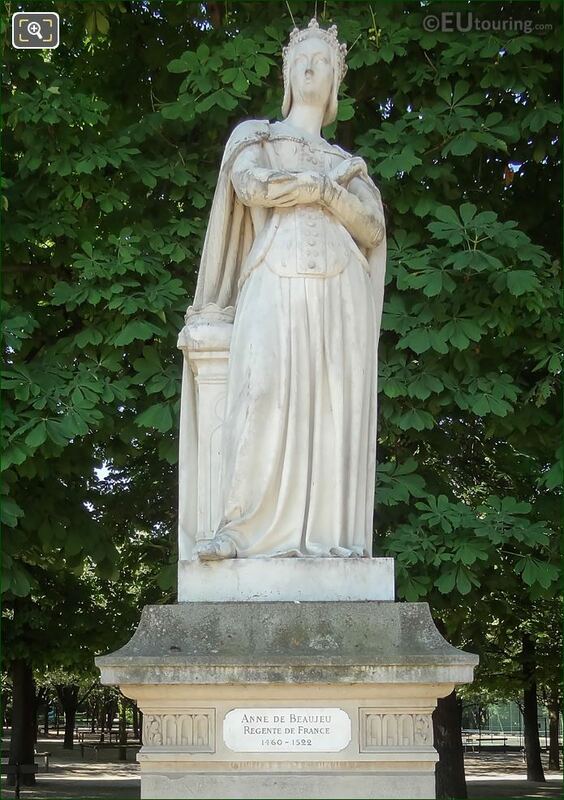 And Anne of Beaujeu, also known as Anne of France, was the eldest daughter of King Louis XI and his second wife, and she was the sister of Charles VIII who became King of France when their father died, yet due to his age she became the Regent and was one of the most powerful women of her time in Europe. 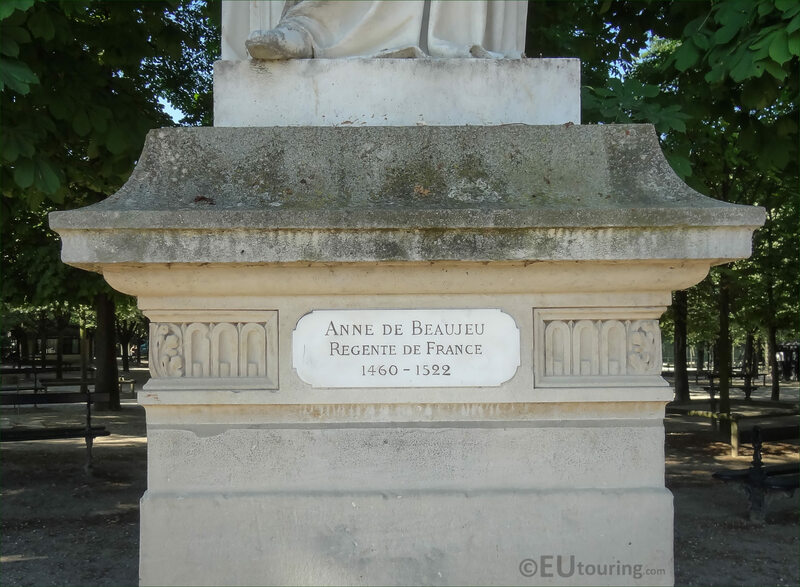 Yet in this last image, you can see how the artist has depicted Anne de Beaujeu, who reportedly stood as straight as a lance, was strong, formidable and extremely intelligent, even making the final treaty to end the Hundred Years War. 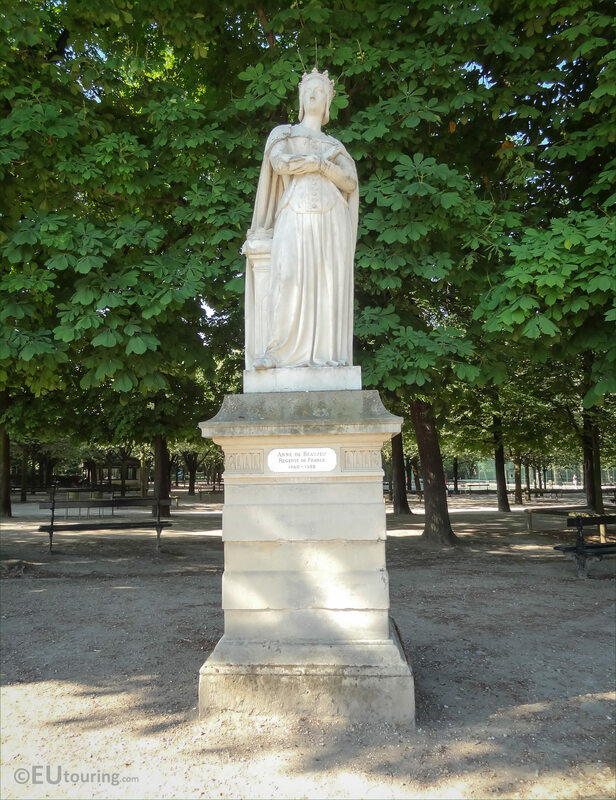 So, this statue within the Queens of France and Famous Women series can be found on the western terrace of the Jarding du Luxembourg overlooking the Grand Basin of the formal part of the gardens, and this is to the left hand side as though you are looking towards the Palais du Luxembourg.